Scientists uncover the neurons in the mouse brain responsible for linking the sight of a looming object to scared behavior. WIKIMEDIA, RAMAAnimals respond to fear in predictable ways. A mouse confronted with danger is likely to either freeze in place or run for its life. But how this primal response is elicited in the brain has remained murky. 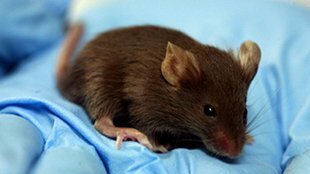 A study in mice published in Science today (June 25) reveals specific neuronal wiring that runs between the eye and the amygdala—the emotion and decision-making center of the brain—that translates the sight of an advancing threat to the animal’s instinct to freeze or flee. Fear behavior is critical for survival, and animals and humans use all their sensory inputs to detect, assess, and escape from life-threatening situations. In the case of visual threats, researchers have identified cells in the retina that respond to looming objects. Then, in the midbrain, a structure called the superior colliculus, which receives retinal neuron inputs, contributes to avoidance and defensive behavior. “However, the neuronal cells mediating these behaviors, and the circuits linking them to fear response remain unknown,” wrote Peng Cao of the Chinese Academy of Sciences in Beijing in an e-mail to The Scientist. 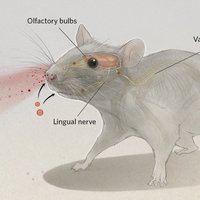 As a first step, Cao and his colleagues optogenetically stimulated all neurons in the superior colliculus of mice and found that this was sufficient to produce a fear response in the animals—the mice froze in place. The researchers then engineered specific subtypes of superior colliculus neurons to respond to light and found that stimulation of neurons expressing the calcium-binding protein parvalbumin (PV) produced a similar fear response—the mouse first attempted to escape but quickly froze. Stimulation of neurons expressing somatostatin (SST) or vasoactive intestinal peptide (VIP)—both peptide hormones—elicited no fear response at all. To determine whether the PV neurons were indeed responsible for transmitting information about visual threats, the researchers displayed a virtual soccer ball that appeared to roll toward a stationary animal. Recordings taken from the animal’s superior colliculus revealed that the virtual ball induced high activity in the PV neurons. 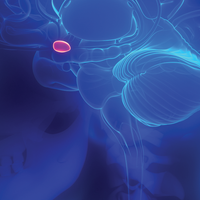 The team went on to show that the PV neurons projected to a number of different regions within the brain, including a structure called the parabigeminal nucleus (PBGN), which leads to the amygdala. Local optogenetic stimulation of the PBGN induced the same fear response as that seen during PV neuron stimulation in the superior colliculus. 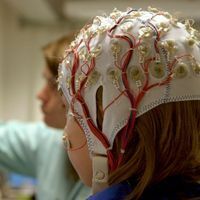 “To me that was a surprise—that [the neural signals] take so many stages to arrive at the fear place [the amygdala],” said Botond Roska of the Friedrich Meischer Institute for Biomedical Research in Basel, Switzerland, who also was not involved in the study. 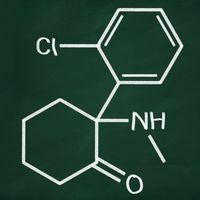 “I thought that this pathway would be a more direct and specific connection because it must be [processed] very fast.” Indeed, a quick decision is essential when facing a dangerous predator or falling boulder. In addition to working out how the separate stages might modify the transmission, Cao would like to know whether humans share the same pathway as rodents and, if so, whether the pathway plays a role in any mental disorders. C. Shang et al., “A parvalbumin-positive excitatory visual pathway to trigger fear responses in mice,” Science, 348:1472-1477, 2015.